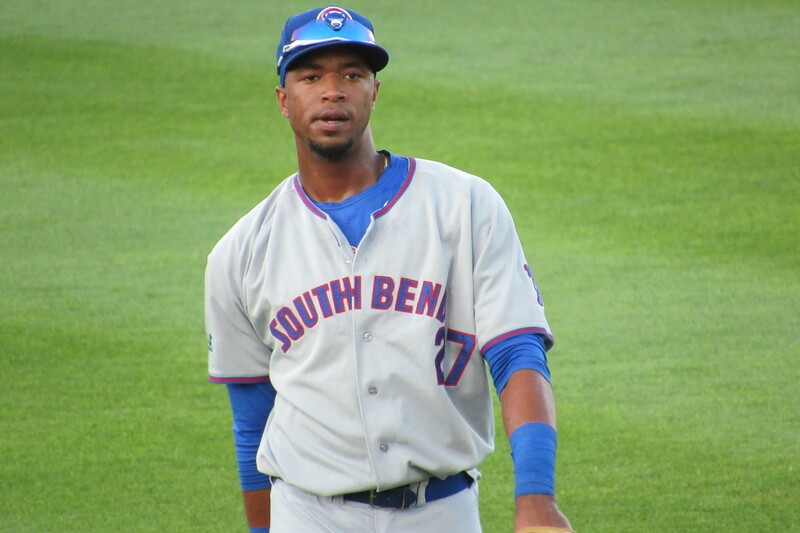 South Bend Cubs OF Eloy Jimenez homered and drove in four runs in Tuesday’s Midwest League All-Star Game. This year’s Midwest League All-Star Game was a true midsummer classic, as the two sides traded offensive blows throughout the contest, with the Eastern Division All-Stars coming out on top with an 11-10 win. In the early innings, it appeared as though the Western Division All-Stars might breeze to victory, taking an 8-1 lead into the 4th inning. But that’s when the East’s bats woke up, driving in five runs to make it an 8-6 game in the middle innings. The East rallied for another run in the top of the 7th to make it a one-run game, but the West responded by plating a pair in the bottom half to take a 10-7 lead. The two West runs in the 7th came off the bat of Cedar Rapids Kernels catcher A.J. Murray, who slugged a two-run homer. The All-Star Game was played in Cedar Rapids this year, so Murray’s late-inning heroics predictably pleased the crowd, which erupted into loud, prolonged cheers. At that point, it seemed Murray’s blast would be the highlight of the night. Cedar Rapids Kernels catcher A.J. 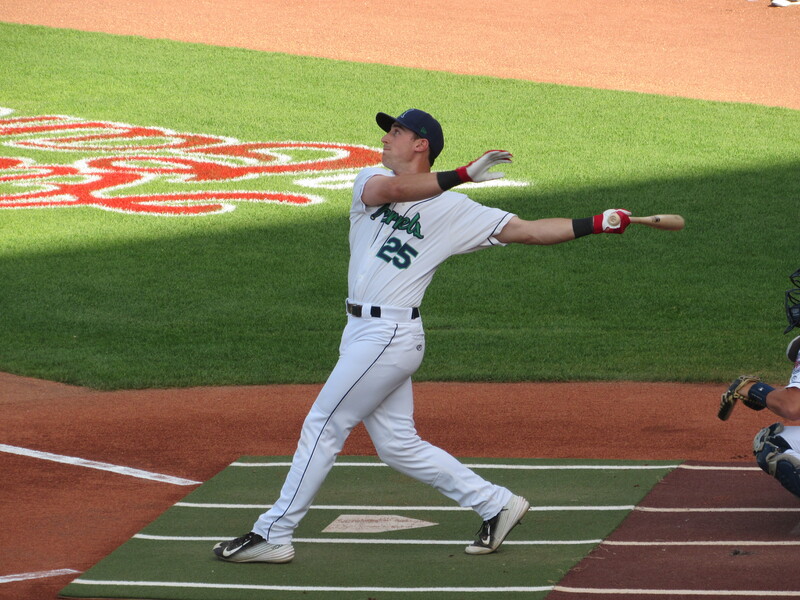 Murray connects with a pitch during the Midwest League Home Run Derby. That would change in the top of the 9th. The East All-Stars led off with back-to-back singles by West Michigan Whitecaps infielder David Gonzalez and South Bend Cubs outfielder Donnie Dewees before Wisconsin Timber Rattlers RHP Marcos Diplan retired Bowling Green Hot Rods catcher Brett Sullivan on a grounder for the first out. 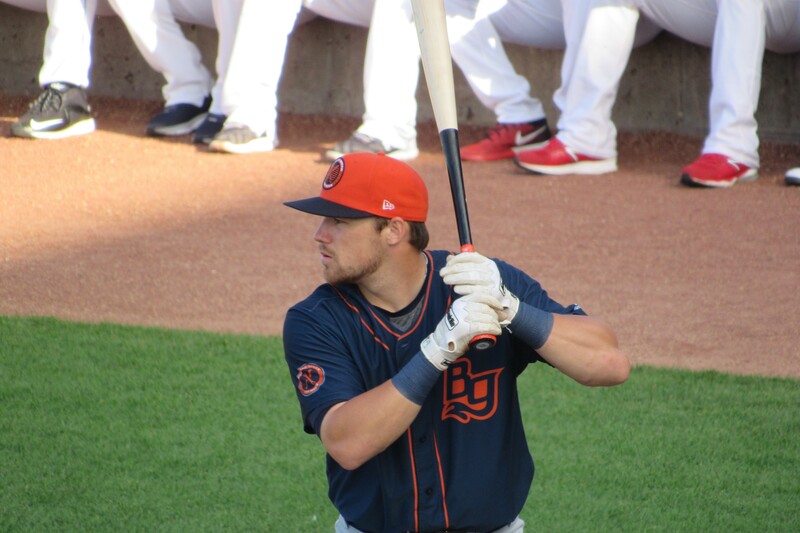 Bowling Green Hot Rods catcher Brett Sullivan went 1-for-2 with a double and won the pregame Home Run Derby. A pitching change followed, with Clinton LumberKings RHP Darin Gillies replacing Diplan to face Cubs outfielder Eloy Jimenez, who drove in a run earlier in the game. After reportedly telling his teammates he would homer, Jimenez crushed a pitch over the fence in centerfield to tie the game 10-10. The monster shot, which traveled well over 400 feet, was the new highlight of the evening, especially after the East went on to score once more for the lead and shut down the West in the bottom half of the inning. Jimenez, who started in leftfield and played the entire game, earned the Top Star Award, which is equivalent to being named most valuable player. It is the second year in a row that a South Bend Cubs player earned the award, after pitcher Jeremy Null won it last year. 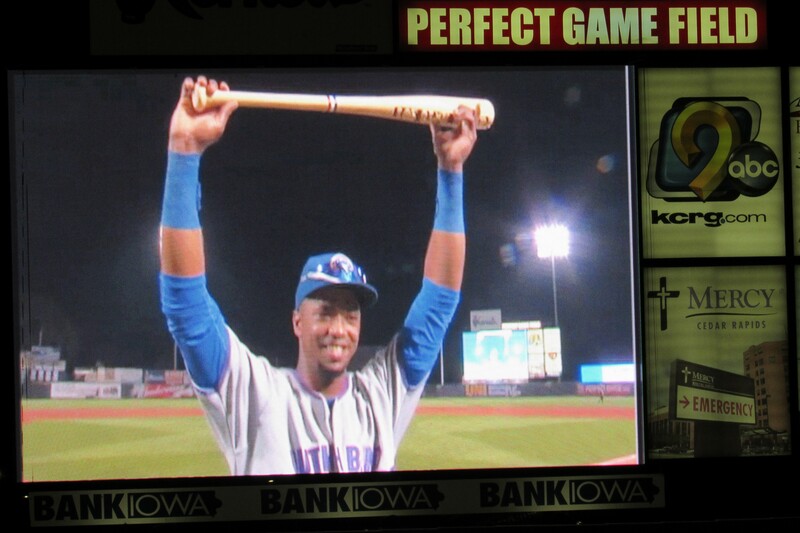 South Bend Cubs outfielder Eloy Jimenez is seen on the scoreboard hoisting his Top Star Award bat-trophy. 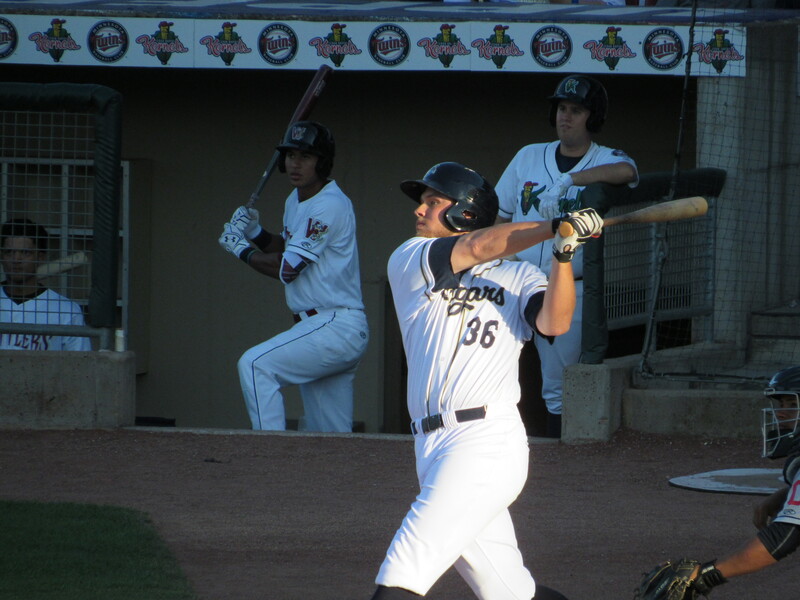 Kane County Cougars first baseman Trevor Mitsui went 2-for-3 with a double and three runs batted in. His first-inning double drove in the first two runs of the game. Kane County Cougars first baseman Trevor Mitsui drove in two runs with this swing in the 1st inning. A total of 56 players were used in the game. You can see the box score here. Attendance was announced at 4,565. This entry was posted in 2016 All-Star Game, Bowling Green Hot Rods, Cedar Rapids Kernels, Clinton LumberKings, Kane County Cougars, Midwest League, South Bend Silver Hawks, West Michigan Whitecaps, Wisconsin Timber Rattlers. Bookmark the permalink.